When it comes to laptops, especially the sleek and portable ones, the biggest gripe that users have with them is their weak gaming performance due to the integrated graphics card’s underwhelming output. But for all the users who have long been wishing for a PC add-on that could provide them with the same raw graphics brawn as desktops, or at least gaming laptops, Lenovo has finally unveiled a solution in the form of its Thunderbolt 3 Graphics Dock. 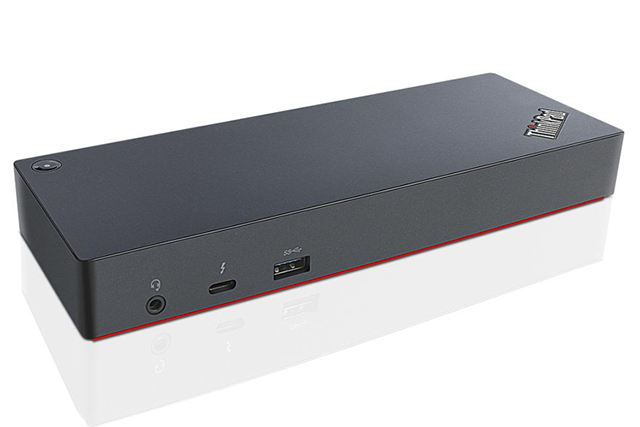 Unveiled at CES 2018, Lenovo’s Thunderbolt 3 Graphics Dock packs the NVIDIA GeForce GTX 1050 4GB MXM GPU to push the graphics performance way past the integrated Intel HD or the MX150 graphics present inside ultrabooks. But the graphics performance is just one among the many advantages of the dock, as Lenovo claims that its new creation also supports Windows Mixed Reality (WMR) at a refresh rate of 90Hz. The Thunderbolt 3 Graphics Dock connects with PCs via a USB-C cable and is capable of providing up to 65W of power for the attached system, acting as a portable charging point to juice up supported devices. As far as connectivity is concerned, the device features two USB 3.0 ports and one USB 2.0 port, alongside a Gigabit Ethernet port and a 3.5mm jack too. However, Lenovo’s Thunderbolt 3 Graphics dock has some serious shortcomings too. First of all, the device only has support for Lenovo Ideapad 720S laptop as of now, and despite Lenovo promising that more devices would be added to the compatibility list, support for PCs from other brands might be quite far away. Secondly, the NVIDIA GeForce GTX 1050 (not its ‘Ti’ version) packed inside the dock is an entry-level GPU, and it is only good for lightweight to casual gaming, so any hope of playing games at high graphics setting is just a distant dream. Moreover, the NVIDIA GeForce GTX 1050 does not support VR, so users who want to pair the dock with HMDs (Head Mounted Display) for an immersive experience are out of luck. This dock is however ideal for those who need a little extra power to run intensive productivity or video-editing applications. As for market availability and pricing, Lenovo’s Thunderbolt 3 Graphics Dock carries a price tag of $399 and is expected to hit the market later this month, however, the company has not detailed the region-wise availability.